ISN will be throwing a huge curveball in the recruiting game this coming September 25 with what we call Europe’s first recruiting event that’s for the athletes!! Players will be tested and have web bios on all of our sites for American coaches to evaluate,with recruiting and high school placement assistance. Players will also be rated & ranked on the ISN website.Player registering for the camp can find the link on our website http://www.intscoutingnetwork.wordpress.com this is an event you don’t want to miss, an opportunity that can’t be passed. If your a young athlete ask yourself this! Have I paid for a camp and went a gave my all? Yes What did I receive?A cool t shirt!!!! And the hopes of somehow getting seen are heard about. Well that’s were ISN is steps in! We are Europe’s first REAL recruiting service. Not only do players attend our combines are camps! Players also receive web bios similar to other American services. 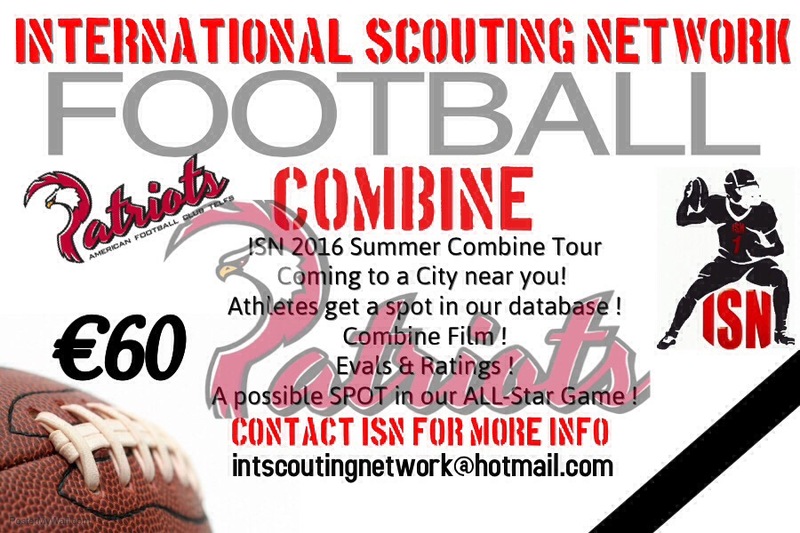 All information from ISN combine and camps will be list in their bios along with film and player evaluations. WHAT OTHER CAMP OR COMBINE HAS OFFERED YOU THIS? And it doesn’t stop there!!! Are you familiar with the USA and IFAF Development teams! I’m sure you have. Well we know first hand most guys can’t afford all the fees a lot are overlooked and some just don’t have the chance. THAT ALL STOPS WITH ISN Development Program. We offer the most affordable development program in the world and all proceeds goes right back towards the athletes. We have game sites set in GA and FL, interest from schools looking for friendly games and not to mention a list of coaches all ready to come see you guys perform! WE WORK! This summer alone we have gotten European athletes multiple offers, a couple of German players that believed in ISN are now heading to America to play HS ball in sunny California! NOW TELL ME IS ISN A SERVICE YOU CAN TRUST!